A plethora of winding mountain passes link ski town to ski town along the Powder Highway. The astonishing road placement provides tantalizing views right from the passenger seat making it surreal to think that these wild vistas were only exposed to the masses due to the mining industry. Yes friends, much of our region was developed for it’s rich supply of natural resources. 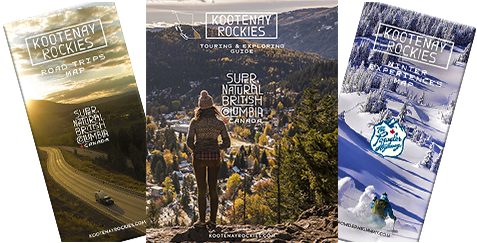 Contrary to popular belief, the towns we currently associate with skiing such as Kimberley and Fernie were in fact placed on the map due to the mining industry but as skiers and snowboarders we couldn’t be more grateful. One mining boom after another eventually connected our corridor through the development of valleys, expansion of railways, addition of roads, and eventually united us in passion through skiing amenities. Explorers in the late 1800’s were certainly not on the hunt for epic ski terrain, rather natural resources. This was the distinguishing factor for settlement placement, convenient for us ski loving folk today that our mountain ranges are chalked full of natural resources including coal, iron, zinc, gold and many others all hidden in skiable mountains beautifully coated in timber. The art of prospecting chiselled routes into many untamed regions throughout the immense mountain-scape that we can now access with ease via road. Still a pillar industry for many towns through out interior southern BC, mining has since changed its approach to a more sustainable format and is often out of sight. However, some of the earliest mining that took shape right in the town centres in the late 1800’s that we currently know as Fernie, BC and Kimberley BC, each with its own storey to tell. Connecting the past with the present we ski toured to a few historical sights this winter, merging the current ski tourism industry with the establishing industry of the region, mining. The North Star Express high speed quad at Kimberley Alpine Resort pays tribute to the North Star Mine that once operated on it’s slopes. To the lookers right of the chair tucked into the gladded trees you can still find evidence of old mine shafts and ski past a piece of history in bounds. North Star wasn’t the only mine for long; prospectors staked claims for the nearby mountain laced in lead-zinc, which quickly was dubbed Sullivan Mountain. For over a century the Sullivan mines where the heartbeat of the town complimented by the development of the railway and logging industry. With the mine closing in 2001 much of the area associated with mining is still private property making exploration difficult and unsafe. On the outskirts of Kimberley lies a hillside covered in solar panels. Efforts to convert unusable land that was toxic during the peak of the mining has found a second life a renewable energy source generator and is the largest solar mine in BC. Known as one of the sunniest places in BC, Kimberley is a great place for solar and an equally great place for skiing. Kimberley Alpine Resort offers perfectly pitched groomers and from town countless backcountry opportunities exist including the well known Boulder Hut and St. Mary’s Alpine Park. With the mines closing somewhat recently touring past historical mining wasn’t an easy option, but here’s how you can combined the history of Kimberley and skiing. Kimberley Alpine Resort: The original ski hill of it’s time has a few sneaky hidden mine shafts of it’s own to find or just bask in all of the symbolism of a mining town reflected on ski run names and charm. Kimberley Nature Park: While its trail network is based on routes from mining explorers in the early 1900’s its ski history is deeper than you’d expect. The Nature Park hosted one of the first ski jumps in the area and drew big weekend crowds to watch in the mid 30’s. Now the entire zone is ripe for the skiing. The gladded slopes offer great storm skiing and the up tracks are yours for the making. Hint-hint, there are plenty of pillow lines to be found. Kimberley Underground Mining Railway: This flat land ski can be done on AT gear, cross-country skis or even snowshoes. Sticking to the unplowed road you’ll pass a collection of old mining equipment, historical buildings and parts of the once used underground railway. For the full experience be sure to visit this spot in the summer when the museum is open for an underground tour! It wasn’t a smooth start for the mining industry in the Elk Valley. With limited funds and no railroad for export, it took a determined William Fernie 10 years to get the coal industry bombing. The fire of 1904 whipped out nearly the entire settlement with just enough time to rebuild only to be devastated again by the great firestorm of 1908. Legend of a curse haunted the valley during these times and through the great depression. It was believed that the prospectors had done the First Nations wrong in an agreement and that the ruthless force of nature upon the town was the consequence. Coal ventures bloomed into their full potential across the entire valley in the 1960’s with the help of Japanese investments. Mining opportunities dotted the valley many of which are still functioning today and a handful of abandon sites lie on skiable slopes, perfect for adventuring. The skiing itch struck in the valley in the 1950’s, passionate skiers hiked many of available slopes from town. For two years (1960-1961) various rope tows were moved from one slope to another until the formalization of the Fernie Snow Valley Resort was formed in 1962 with two rope tows and an A-frame cabin. This was the humble beginnings of Fernie Alpine Resort. The original land was donated by Galloway Lumber and does not hold direct mining history, but the resort should not be missed on any ski journey through the Elk Valley. Here are a few suggestions on where to combined both past and present industry via ski tour. Coal Creek: Trails lace the mountainside of the Coal Creek valley, but the best skiing and most entertaining sights are located off of No.9 Mine Trail. This route will bring you to the ghost town show off it’s impressive infrastructure. Still lingering are the notable conveyor building, an electric host, tunnels (blocked) and ventilation fans. If you’re craving more vertical venture further but note that this steep trail is in prime avalanche terrain. Hosmer, BC: Up for 800 vertical meters of blow powder in the forests of Hosmer? The best part, the climb starts and ends with a fully exposed powerhouse that’s in great shape. Don’t venture inside it’s walls as the flooring is fragile and many holes are hidden with snow during the winter. It can be appreciated for all it’s glory from the outside just fine. Park near a wall of 46 coke ovens, cross the road to the hello FSR gate and start working your way up after appreciating the mining structures that are the reason you’re able to access such terrain. Morrissey Mines: While visually much of the mining past is hidden here as it was closed in 1910 after a short operational period, it’s creation has left us will incredible skiing access. On the south west side of the Elk River you’ll be able to gain elevation via an old FSR and then push further up to ridge line for over 1,000 vertical and end up right at your vehicle parked beside some over grown coke ovens. Now that’s the kind of access we’re grateful for! Uncovering the past by ski touring felt as through we were chasing the legend of the region. It left us not only feeling connected to the mountains and their undeniable magnitude but also connected to the people and the movements that made these places thrive. It was a humbling experience to pay tribute to the early explores, miners and the ruminates of their efforts. Little did these hardy people know that their efforts would go far past their lifetime, they would change our mountains, introduce the railway, aid in building roads and further exploration of our beloved mountains and of course skiing. *While ski touring is recommended in this article please note that locations suggested are potentially in avalanche terrain and individual research and trip planning should proceed any outings. Proper avalanche knowledge, training and gear is required. Also note that old mining sites are often fragile in structure and it recommended that you observe them from a distance. Guest post by Abby Cooper.